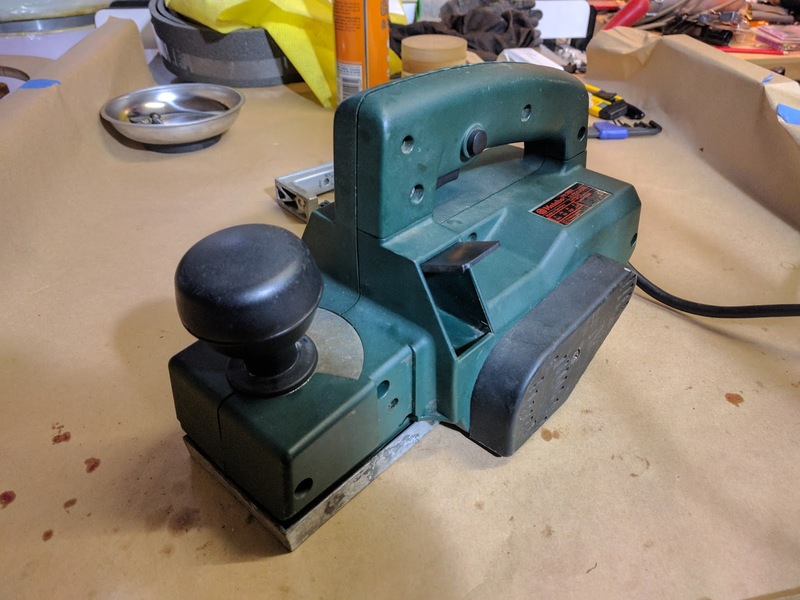 Incomplete attention span: Salvaged Metabo HO 0882 Planer - It Lives! Two years ago, I pulled this planer out of a skip ("dumpster" for any North American readers) near my gym. It was pretty dirty, but still in one piece, so I took it home and nervously spun it up with an RCD, just in case something shorted. To my great surprise, it actually worked. I figured some tradie on the nearby work site decided the bearings were shot and the blades were broken and it was cheaper to just buy a new one...or something. As this was one of the more complicated things I've ever taken apart, it took me a a while to work out howto disassemble it. 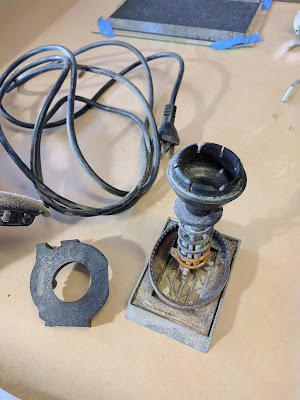 Much swearing and excessive force later, I had managed to remove the bearings (without a puller) and have it all in pieces in a bucket in my workshop. 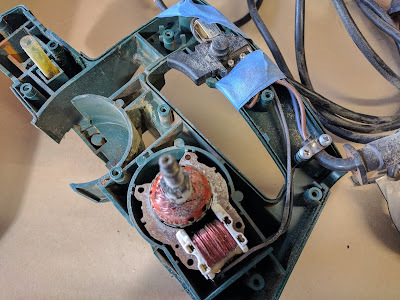 Since the disassembly was so traumatic, and I didn't really have a use for a power planer, there it stayed there, gathering dust, for 2 years. Recently I acquired (aka picked up off the curb) a bunch more free timber in the form of a discarded bed frame and require a fast way to remove the varnish. Since I don't really want to put the varnished timber through my main jointer/thicknesser, and I remembered that I still had "reassemble the free planer" on my todo list, I figured now was a good time to attempt the project. I started by giving everything a half-hearted clean (I wasn't sure how well it was really going to work) and take stock of the situation. I found a PDF on a spare parts website that shows the exploded view of the planer - but the resolution was terrible and the model differed very slightly from the on I had - mostly in regards to a few screws and washers. I had gotten really frustrated when taking it apart, as I couldn't find any videos or documentation of anyone doing the same thing. It made simple things like "how do I remove these pulleys" take ages for me to work out (just so you know, they aren't press fit, they are screwed on). As a result, I decided to try to film the reassembly for anyone else who may find this procedure useful in the future. As a bonus, while reassembling the plane, I managed to establish a possible real reason the planer was thrown away. The locking button for the trigger doesn't seem to work anymore. I could imagine this would be quite annoying for anyone wanting to use it for extended periods of time (such as a tradie on a work site). For me, however, this is a minor inconvenience. All up the project cost me the price of some new bearings (AUD$14.50) and some new blades (AUD$9.99).